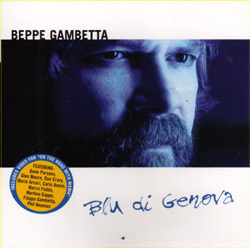 Gadfly Records is proud to announce the release of Blu di Genova, the new release from world-class flatpicking guitarist Beppe Gambetta. Gambetta, an Italian master guitarist, has been well-known in the music world for two decades. On this new album — his tribute to the connections of his old-world homelands and America’s new world — he teams up with other first-rate musicians, including Dan Crary and Gene Parsons. The mostly-instrumental CD features three vocal cuts, one of them a cover of Norman Blake’s "Church Street Blues." The CD also includes a video of the opening cut, "On the Road With Mama," and all the software needed to view it. Look for a short Beppe Gambetta tour in April-May and an extended tour in September-November (tour dates to come).